In an earlier Q+A on the website questions were raised about the origins of Reiss Bradley, which was the parent company of Far East Flying School and Far East Motors. The firm was one of the leading British hongs engaged in the trading of a wide variety of products ranging from Texaco petroleum products to Land Rovers and was the result of the 1936 merger of two historic British trading houses in the Far East– Reiss Massey & Co (泰和洋行, Reiss Bradley inherited its Chinese name)and Bradley & Co (德記洋行) – both of which traced its presence in China back to the mid-19th century. After the War, Reiss Bradley became a subsidiary of the Hutchison group and as a corporate entity existed until 1997 when it was dissolved. Reiss Massey traced its origins to a German family by the name of Reiss who moved from Frankfurt to Manchester UK where they established the trading firm of Reiss Brothers in 1818.Within three decades, they became a major trading firm with over 100,000 pounds in capital and in 1846, Reiss Brothers established its branch in Canton under the name of G. Reiss & Co. In Hongkong, the firm first appeared in the 1859 Hongkong Directory with D. Fincham as principals and J.B. Hallam and H. H. Severs as members of staff. Business was suspended during the Second Opium War and the firm was represented by the British firm of Holliday, Wise & Co in HK until its branch was re-opened at No. 20 The Praya in 1864. The 1867 China Directory listed Frederick Adams as manager and W.S. Foster as tea-taster. The same year, Reiss & Co admitted German British Adolf Hermann Christian Anton Zimmern (1842-1916) and James Wheatley as partners in HK and Leopold Kahn the next year. Although Adolf Zimmern returned to the UK after a few years, he left a significant legacy in Hong Kong as the patriarch of a prominent Eurasian family he started with Ip Lai-kam (according to Eric Ho’s Tracing my Children’s Lineage, Ip’s father was a Caucasian by the last name of Ipsworth) and his descendants include Sir M.K. Lo and his brother M.W. Lo C.B.E., Judge Archie Zimmern, Stock Exchange chairman Francis Zimmern and DBS headmaster George She. Adolf was also the father of noted Oxford scholar Sir Alfred Zimmern, the founder of UNESCO who coined the terms “British Commonwealth” and “Welfare State” through his marriage to Mathilde Eckhard after he returned to the UK. In its first century, Reiss & Co primarily focused on the traditional China trade products such as silk and tea and by 1877, branches were established in Shanghai and Yokohama with Morris Kalb and C. Braun in charge of the two branches respectively while Charles Kahn oversaw the HK branch. By 1884 however, Kahn and Braun were no longer with the firm and Carl Stiebeloversaw the HK branch until 1867 when he left the firm and was replaced by Roderick Mackenzie Gray. In 1893, its HK address was listed as Duddell Street. In 1899, the Shanghai branch was appointed agent for the Yorkshire Insurance Co (now Aviva) and Reiss also represented British American Assurance, Union Insurance Society of Canton and New Zealand Insurance Co. In the 1910s, additional branches were established in Tientsin, Hankow, Pekingand Cheefoo and the firm also expanded into the other businesses such as packaging, wharves and godowns, representing shipping companies such as Pacific Mail Steamship and Ellerman Lines and the products it dealt in also expanded from traditional Chinese products to many industrial goods such as machinery (via Anglo Chinese Engineers Association which was formed in 1915)and construction materials. Reiss was also the distributor of Texaco petroleum products in HK before the latter set up its local branch in the 1920s. In terms of the Reiss family, the partners in charge in the second half of the 19th century were George Emil Adolphus Reiss (1835-1913) and his brother James Edward Reiss (1836-1913) and George’s sons – Henry Jacques, James Arthur and Friedrich. Most of the family members remained in Manchester where they ran their multinational business empire out of its Quay Street head office. When Reiss Brothers held a belated celebration (due to WWI) of its centenary at the Grand Hotel in Manchester in 1919, Henry Jacques Reiss (1865-1946) was the head of the firm. His son Willoughby E. Reiss (1890-1915) lived in Shanghai but was killed in action in Gallipoli, Turkeyin 1915, one of the casualties of the 180 Reiss staff who served in the British Army during World War I. Denys Reiss was listed as head of the Shanghai office in the 1930s and 1940s alongside P.F.F. Watkinson although he probably also spent time in HK as his 7 months old son Timothy Denys Reiss was buried in the HK Cemetery in 1933. Hugo Reiss (1881-1931, father of famous American socialite Jane Engelhard and grandfather in law of the famous designer Oscar de la Renta) from one branch of the family took over the Shanghai branch of G. Reiss& Co in 1908 and started Hugo Reiss & Co.
Like other trading houses in Old China, Chinese compradors contributed significantly to the success of Reiss & Co. In Shanghai, it was the Lo family whose association with Reiss began with Lo Hon-chun who joined the firm at the age of 19 in 1867. Hon-chun’syounger brotherLo King-kee (勞敬修, 1863-1959) joined the firm at the age of 14 in 1877 and ascended to the position of comprador in 1905 at the recommendation of its manager J. Stern. Lo King-kee was also a key figure in the industrial development of modern China as he was involved with financing Nanyang Brothers Tobacco and M. Y. San & Co and its affiliate China National Sugar Refinery (see article) and served on its boards. Nee Ching-chwang (倪钦章) was another Reiss comprador in Shanghai well known in the cotton business. For its first 70 years in Hong Kong and Canton, the Ip (Yip) family from Kat Tai Village in Heungshan (the hometown of many compradors) served as compradors of Reiss & Co, starting with IpKiu-shek and his brother Ip Chuk-kai (葉竹溪),who were the comprador of the Canton and HK branch respectively. Ip Chuk-kai was a well-known leader in the Chinese community in HK at the time, having served as chairman of Tung Wah in 1881 and Po Leung Kuk in 1894. Kiu-shek’s son Ip Shun-kam (葉舜琴) joined Reiss’ HK branch as an assistant after he studied English at Queen’s College and succeeded his uncle as HK comprador after his uncle died in 1901. In addition to having served as adirector of Tung Wah Hospital (1905-06) and afounding benefactor of HKU, Ip Shun-kam was also elected chairman of the Canton Chamber of Commerce in 1912. In 1921, he was succeeded by his son Robert Yip King-ling (葉魯弼) and passed away in 1924.Robert Yip continued to serve as comprador for Reiss’ successor firms until 1926 when he disappeared due to losses from stock market speculation and he and his brothers Thomas Yip King-yuen (葉敬元) and Edward Yip King-sau (葉敬修) were sued by Reiss & Co in 1928 for missing funds totaling over HK$50,000. The embezzlement charges were dropped in 1932 after the accounts were settled by sale of certain assets owned by the Yip family. 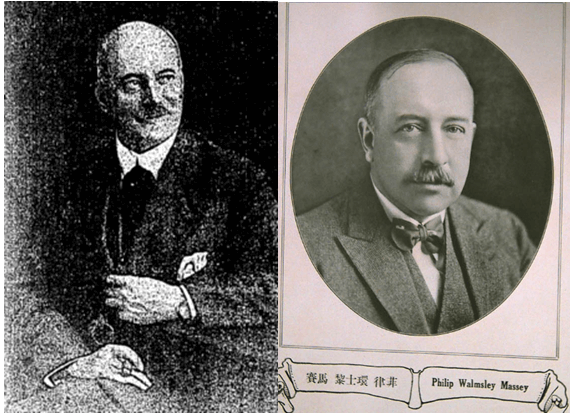 In May 1923, Reiss & Co went into liquidation and a result, the firm’s operations in China was taken over by two of its senior partners on the ground -Percy Hobson Holyoak (1874-1926) and Philip Walmsley Massey (1876-) under the name of Holyoak Massey & Co. (One of Reiss’ property in Shanghai was auctioned off to Swire) The son of Reverend T.H. Holyoak from Buckinghamshire, Percy Holyoak came to HK to join Reiss & Co in 1899 and rose to become the head of the HK office, representing the firm’s staff in China at the 1919 centenary celebration in Manchester described above. 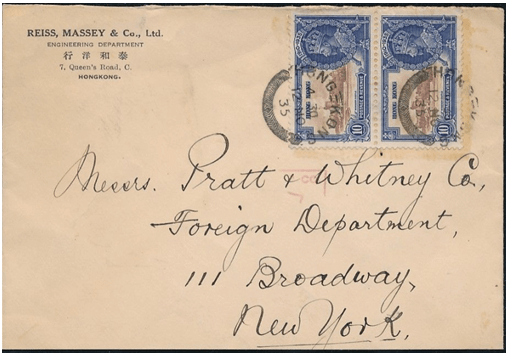 A native of Wilmslow, England, Massey also joined Reiss in China in 1898 and rose to become head of the Shanghai office. As the head of a leading hong, Holyoak held many important positions in colonial HK, including chairman of the HK General Chamber of Commerce (1917-18, 1920-21), chairman of the HK Club, Alice Memorial Hospital and Scout Association and unofficial member of the Legislative Council from 1915 and Executive Council from 1920 until his death in 1926. He also served as chairman of HSBC for three times and was chairman of the HK Canton Macao Steamboat Co and Union Insurance Society of Canton and a director of HK Telephone. Meanwhile in Shanghai, Massey also served as member of the powerful Shanghai Municipal Council and board of the British Chamber of Commerce. In 1925,Holyoak Massey installed the hot water system at the Tsim Sha Tsui YMCA, which PH Holyoak was the vice president of. In April 1926, Holyoak left for the UK to report the Secretary of State for the Colonies on Chinese political and commercial issues. Suffering from kidney illness for several years, he died shortly after arriving in London on May 25. Upon his death, the firm’s name was changed once again to Reiss Massey although Massey retired from all executive duties in 1931. In 1930, Reiss Massey installed the Scottish-made equipment for the main kitchen of the newly built Peninsula Hotel in Kowloon. The firm also benefited from the infrastructure and industrial development in Guangdong under General Chen Chi-tang (see article on Union Metal Works and Great South Fishing) and when the Kwangtung Bureau of Reconstruction was building the new Kwangtung Government Cotton Mill in 1933, it placed a large order with Reiss Massey for Platt Brothers textile machinery from Lancashire, England which Reiss Massey represented. One of the subsidiaries which Bradley & Co brought into the picture was Eastern Asbestos Co, which has importing asbestos and other building materials since the 1910s. In the 1941 HK Jurors List, the manager of Reiss Bradley in HK was listed as James Ormiston. During the Japanese occupation of Hong Kong from 1941-1945, one of Reiss Bradley’s senior staff – Kenneth Sinclair Morrison (who was also a director of HSBC) died in the Stanley internment camp in February 1943 at the age of 56. After the War, Reiss Bradleyfocused on the distribution of industrial goods. In the aviation field, it represented Hawker Aircraft and Rolls Royce. In the industrial front, it sold 500,000 spindles to a consortium of Chinese cotton mills financed by the Bank of Communications and sold Hawker Siddeley switchgear equipment to China Light & Power in 1976. In the consumer goods front, it was the distributor of Kelvinator appliances and had a showroom at Realty Building in Central. Its most famous agency however was for the British automobile manufacturer Rover and it operated a Rover showroom at 5 Lau Sin Street in Causeway Bay. In 1966, Reiss Bradley won a £80000 contract for Rover from the HK government for purchase of 82 Land Rovers amid intense competition. 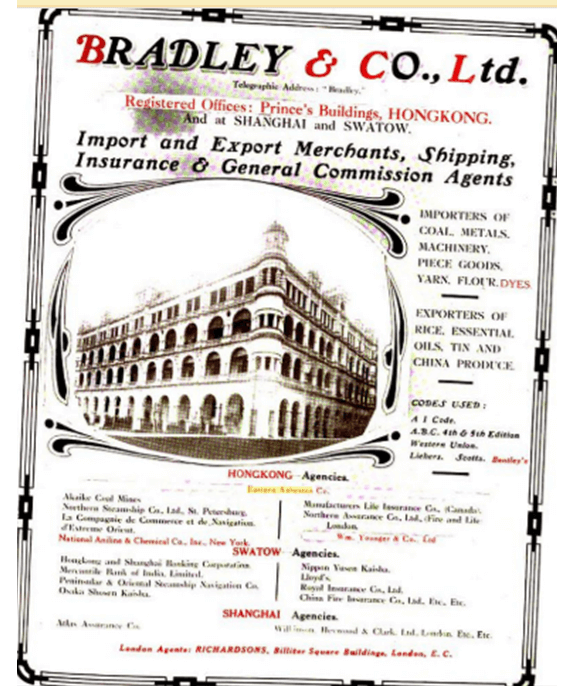 According to the HK Macao and Canton Business Directory in 1949, Reiss Bradley’s office was located at the National City Bank Building at 2 Queen’s Road Central and its board led by managing director John Robinson also included D. S. Hill M.I.E.E. (who was vice president of the Engineering Society of HK), Joseph Brown F.C.I.S., A.I.A.A, and its comprador Lo Kung-mok(羅公睦, was Tung Wah director from 1927-28) in HK and P.F.F. Watkinson in Shanghai (later moved to HK). By the early 1950s, the Marden/Clague interests became minority shareholder in Reiss Bradley and eventually by 1965, Reiss Bradley was acquired by Hutchison International which was expanding rapidly under the leadership of Sir Douglas Clague. 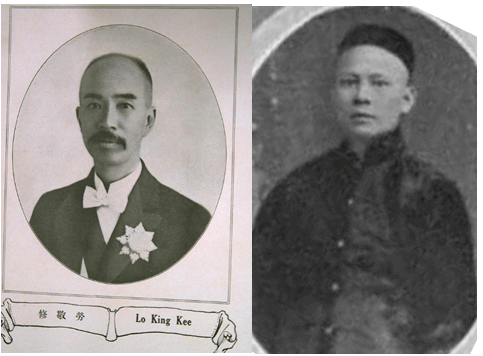 Left: Choi Wai-hang in his later years; Right: Ad of Craig & Donald machine tools represented by Reiss & Co and Anglo-Chinese Engineers Association in the Far Eastern Review in 1920. A major figure in the post-War era at Reiss Bradleywas Choi Wai-hang (蔡渭衡, 1924-2011). Born in Sansui, Choi came to HK at the age of 4 and graduated from Wah Yan College where he was classmate of John Tsang Chiu-for, at one time the highest-ranking police officer of Chinese descent in HK who was deported in 1961 on suspicion of being a Communist spy. He worked for the colonial government and Lane Crawford before joining Reiss Bradley in 1949 as general manager of import and export trade. A longtime member and later president of the left leaning Chinese Reform Association, Choi represented Reiss Bradley at the Canton Trade Fair in 1957 and helped to establish trade ties with the mainland for the British firm. During the 1967 riots, he was detained for 18 months (including 5 months in solitary confinement) for his role as a member of the Struggle Committee. He refused the help of Clague during his confinement and after his release went to work for the “red capitalist” KC Wong (to be covered) before returning to Hutchison in 1972. He remained a consultant to Hutchison even after he left in 1975 to join Cosmo Machinery.Another key Chinese staff at Reiss after the War was Edwin P.S. Hsu (許寶書), a graduate of Lingnan Universitywho headed up its engineering department before becoming managing director of the firm in the 1970s and was involved in the construction of the MTR. As a firm, Reiss Bradley was dissolved in 1997. This article was first posted on 17th August 2018.